I’ve cheated on Tequila … with Pisco. It started when I visited Peru. I was in month three of a seven month journey through Central and South America when I got on a local bus out of Lima, Peru heading south down the Pan-American highway. This part of the Peruvian cost is barren. The ground is beige, the ocean is grey and the low cloud ceiling weighs heavily on everything below. I felt a little lost when I got out of the bus in Pisco and stepped into the sleepy, dusty landscape so I strolled into a town bar for some company. I asked the bartender to make me his favorite drink and watched, filled with white-hot horror as he mixed raw egg whites into my drink. (Raw egg violates one of my many, many food rules.) But the drink was frothy, the bartender hopeful, I was an adventurer – and the Pisco Sour was awesome! I discovered the national spirit of Peru. I’ve noticed Pisco popping up on drink menus with more and more frequency so I can’t be the only one who’s discovered the spirit. To get the scoop, I went to the experts on Twitter and asked their opinion of Pisco. Drink Think @DrinkThink is a Pisco fan and believes Pisco’s popularity is on the rise because quality product is now readily available. Drink Think brings craft spirits to the North West so they must know what they’re talking about. You can find Drink Think here. Imbiber @notjustabarkeep is, among other things, a fellow insomniac and a bartender at Saxon+Parole. And he’s a fan of Pisco. He suggests a classic Pisco Punch or Pisco Sour and says to make sure you get Chuncho Bitters for the Sour. Please go visit Imbiber at Saxon+Parole – with a Twitter handle like Imbiber, you know he’s going to make you a great drink. Chaim Dauermann @notclam (AKA Lifesaver) was passionate and eloquent in his response. He said inclusion of Pisco on a bar menu “…is extremely appropriate for any menu looking to pay respect to the history of cocktails.” Pisco is one of his favorite spirits. I know first hand that Chaim can make you a great drink. He’ll be at Demi Monde NYC when it opens next month! Brian Petro @Creat_Daily is a Pisco fan and says, “I have had quite a few Pisco Sours, and I love the lightness of them. I have been looking for the right one.” Well, Brian, it’s good thing you’re a margagogo follower because …. Greg Harned @craftcocktails was kind enough to share a recipe for an awesome cocktail: Yuzu Pisco. Greg Harned and portlandcraftcocktails.com is dedicated to the craft of the cocktail so I think Greg knows of what he writes. The Hooch Life @TheHoochLife says “Yes, Pisco is definitely growing in popularity. Bartenders are making new twists on traditional drinks with it. A must for bars!” Please check out thehoochlife.com to learn what, how and where to drink – I mean who among us doesn’t need to know all that?! Even The New York Times is on top of the trend with this article from their travel section. 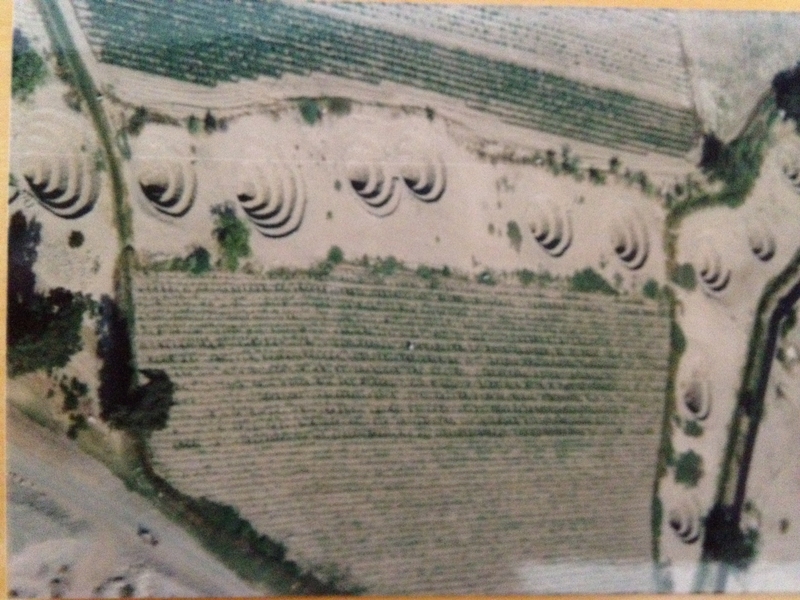 Pisco wasn’t the only treasure I found on the coast of Peru. 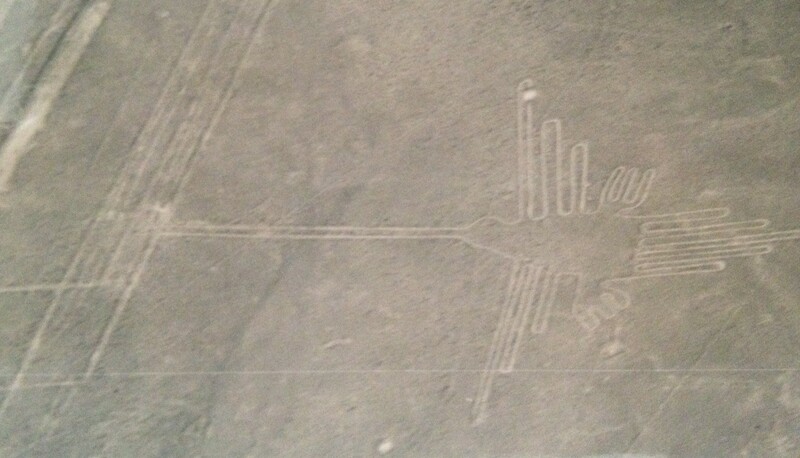 After leaving the city of Pisco, I visited Ica, then Nazca and the Nazca lines. 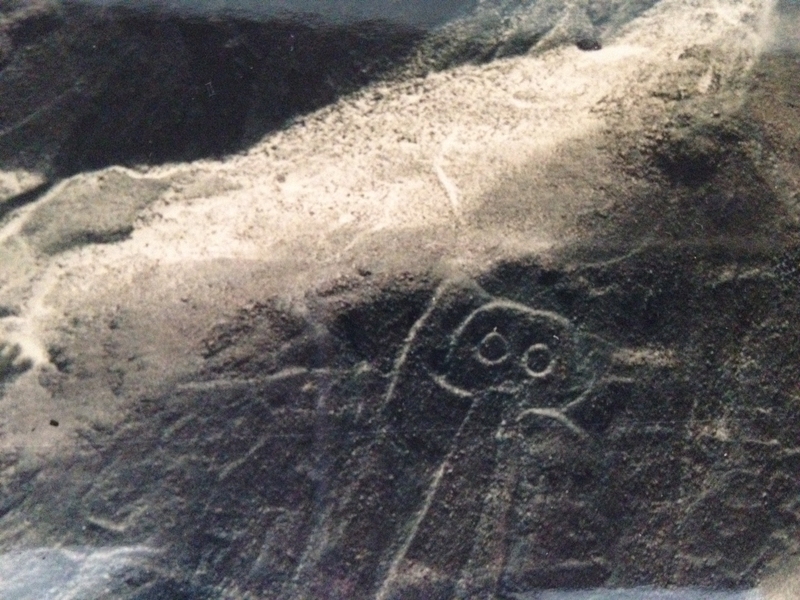 The lines, dug into the earth by ancient people depict a range of things from a condor to a monkey to a person to purposefully designed lines and circles. There are lots of theories on why the designs were made. I like to think they were a gift to whoever was above to see them. And on this day, giddy from surviving raw egg, I climbed into a 4-seat plane and flew over this great gift. The grainy pictures below are my snaps of the lines as the pilot flew back and forth, dipping the wings right and left so we could get a good view. To all the experts who participated in the Pisco Poll – Thank You! I’m sorry for the delay in sharing the results. I hate it when work gets in the way of writing my drinking blog. COMING SOON: NYC Peruvian restaurant and more margaritas in Maine!